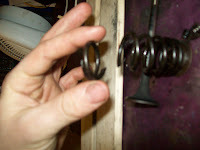 1970 VW Beetle - Minor Restoration: Cylinders all off! The arkward one, drenched in WD-40 and lifed the engine by it and pushed the crankcase, after some work it come off! 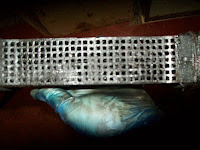 It had been stuck by old oil and rust! All bores are fine, rings dont look too bad? 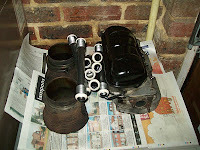 Clened all cylinders using the brilliant 3in1 aerosol degreaser, a wire brush, softbrush and plenty of wd-40 to rinse! 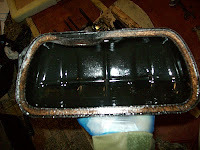 A few problems solved, The rocker cover gasket was criped inside and very thin, could be a large part of my oil leak! The oil filler was clogged with scum, my oil leak had got into the fan and caused havok, to the platig company to get the fanshoroud and fan degresed! 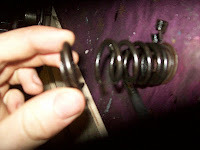 Also, one of my vave springs was snapped! In two bits! Got a new one and fitted it! Valve bolts and screw adjusters are threded; completely knackered.... time to get a new set! Tough work but worth the effort!